I attempted to examine how the traditional Chinese concept of ‘three distances’ (三遠 , san yuan) has served to integrate ‘multiple perspectives’ into traditional ‘Chinese landscape painting’ (山水畫, shan shiu hau) . In the book ‘Lofty Messages of Forests and Streams’ , the artist Gao Xi (郭熙) (c. 1020-1090) of the Northern Song Dynasty, who argues that landscape painting should enable viewers to walk, see, play, and live . He suggests using the concept of yuan to perceive and interpret the relation between the painters / viewers and the scenery in landscape painting. Gao identifies three ways of applying the concept of yuan – ‘three distance’ (三遠 , san yuan) – to landscape painting  : (1) ‘higher distance’ (高遠, gao yuan), (2) ‘deeper distance’ (深遠, shen yuan), and (3) ‘horizontal distance’ (平遠, ping yuan). 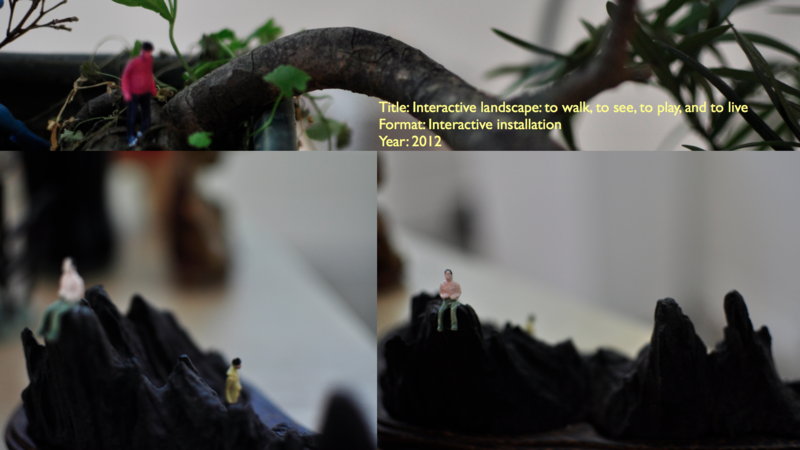 In my “Interactive landscape: to walk, to see, to play, and to live”, I attempted to reinterpret the concept of “three distances” through extending the viewing experience from 2 dimensional plane to 4 dimensional world. 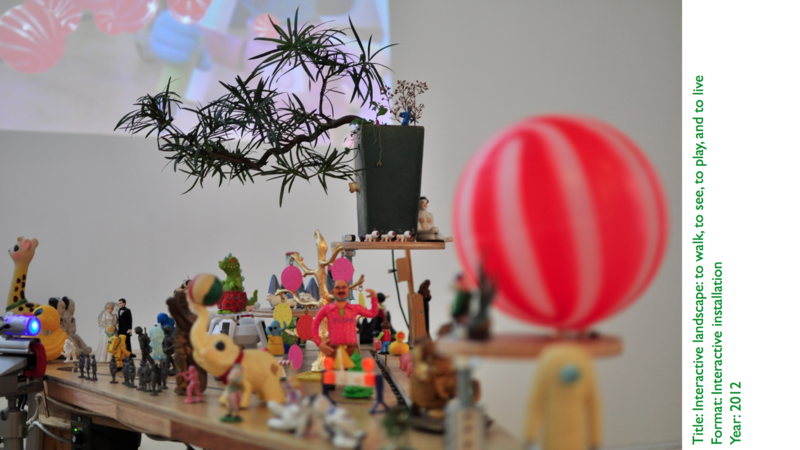 I aim to invite the audience to immerse into the real and virtual space through their participation. Also, I attempt to shift the role of the audience from a passive observer to an active participant. Traditional Chinese art theory had no exact Chinese character or combination of characters whose precise meaning corresponded to the art-theory term ‘perspective’ in English; nevertheless, ancient Chinese artists and theorists possessed methods and theories concerning the depiction and the visualisation of scenery whereby four-dimensional experiences would appear on two-dimensional platforms. One of these traditional Chinese concepts is yuan (遠), meaning ‘distance’. Shan shiu literally means ‘mountain water’. Gao Si (郭思) edited ‘Lofty Messages of Forests and Streams’ (林泉高致, Lin quan gao zhi) which is about his father Gao Xi (郭熙)’s thoughts and sayings about the art of landscape painting.